This morning started out with a lovely breakfast at the Glenerin Inn and Spa, including two of our favorites, bangers and HP Sauce! 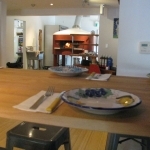 There is a nice selection of hot items, as well as cold cuts, fresh fruits, and pastries and toast. 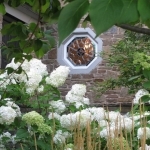 Located in Mississauga, just outside of Toronto, and only 20 minutes from the Toronto Pearson airport, the Glenerin is a peaceful place of calm amidst the city of millions! It is flanked by a forest and below in back is a creek. You’d never believe you were so close to a major world city. Jason Mercier met us in the Great Hall to give the background of the estate, as well as a tour of this stunning building. 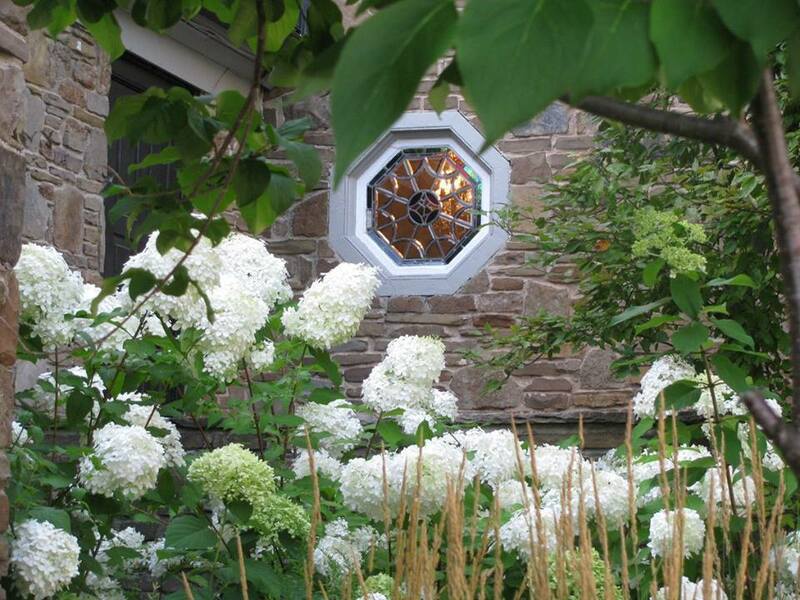 The home was originally built in the 1920s for the Evans family, a prominent Toronto family. At the time, it was far out in the countryside. They used it as a weekend and summer home, as well as for entertaining their friends and family. 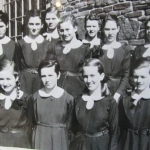 During World War II, St. Hilda’s boarding school for girls in England became endangered since was near site of heavy German bombing, and the girls had to evacuate and be relocated to Canada. ON the way, their boat was caught in a storm, which ultimately saved them. Another boat carrying girls from another school was sunk by a German U Boat, but the storm covered the St. Hilda’s girls, who eventually made it to Canada. Mrs. Evans heard of the girls predicament, and offered the use of her estate at Glenerin as home to the girls for the remainder of the war! The 90 girls lived at Glenerin for 5 years. Later, this home was purchased by a local company and it was offered to employees as a convalescing home free of charge. Eventually , the manor home became a monastery, and this is when the cathedral was added. 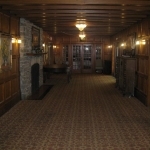 In the 1980s, its current use as an inn began. Jason brought out a collection of old photos from days gone by from the Evans era and the girls school era. 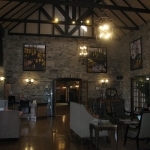 The Inn also has a spa, offering a full menu of services for guests and the public as well. The Glenrerin is a popular destination for wedding parties since everything from the bridal party hair, to the catering can be done on site. 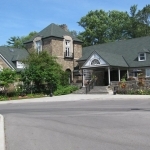 Several events are also hosted at the Inn, including a murder mystery event, and other themed parties. We imagined a Downton-Abbey esque feel, imagining this place in the 1920s when it was first used as an entertainment venue, a heritage that has been revived today. Occasionally during an episode filming, we get a day where we are not working and we get to just be normal tourists sans camera, mics, and wires!! This afternoon was one of those rare treats, so we headed up to Niagara-on-the-Lake (NOTL) to do some shopping and to enjoy strolling this quaint little town. Gail was on a quest for a Cow’s Creamy t-shirt, a cute one that had a cow garbed like Adele, with the saying “Hello from the Udder Side” on it. Very witty, those Cow’s Creamery t-shirts! After popping in and out of several shops and making some purchases of our own, we waited on the street for Gail, who came running up to us very excitedly. She said “Look at this guy coming towards us in the blue shirt…I swear that is Geoffrey Zakarian from Chopped!” And sure enough, after seeing his face and hearing his voice, Heather easily agreed that it was him! (because at this point we were sort of subtly stalking him) We decided to watch where he was going and tried to get Gail to go ask for a quick photo, and we saw him go in a small pizza place on a side street. After more shopping, we were trying to figure out where to eat. UMMM… we just watched a famous chef and restauranteur and Chopped judge go into a restaurant – that’ll probably be a good bet! So we went into Pieza Piesa, owned by Maurizio and Larissa Cesta. He is from Naples, Italy, and has a thick Italian accent! Even though Geoffrey had gone, we had a great lunch thanks to his expert “recommendation!” We even sat at the table where he and his party had just sat. We showed the Cestas a picture of GZ on our phone, and she said “Yep – that’s they guy who was just in here. 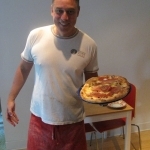 He even knew all about our ovens and everything!” Maurizio told us all about his training and the science that goes into the crust, sauce, cheese, etc. The key he said, is the wood-fired oven and also the right wood. 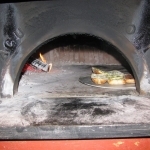 His oven was imported from Napoli, and is a true craft. He, Napoli born and bred, told us that Geoffrey Zakarian had noted “This is the best pizza I’ve ever had that is not from Naples!” HUGE compliment coming from one of Chopped’s toughest judges! Maurizio got a kick out of that, though, since he, from Naples, made it the Naples way, in an oven from Naples!! We think it made his day when he found out that this compliment came from a world-famous chef and tv personality! 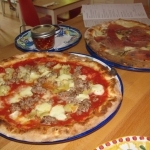 Our pies were red sauce with fennel sausage and artichoke, and a white pizza with olive oil, mushrooms and prosciutto. UNBELIEVABLY delicious. Perfect. Bellissima! Grazi, Maurizio! And Geoffrey.. thanks for the tip! Heather and I are always on the lookout for little inexpensive gifts for our kids. In the UK we love going to the charity resale shops and finding wonderful treasures. In Canada they are not as popular but we did come across a new place for trinkets called Dollarama. 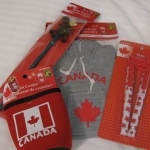 They have an entire section of inexpensive Canadian gifts. There is one drawback…apparently they don’t recognize American debit or credit cards. So I had to go get cash to pay for my items. It wasn’t a big deal but it is good to know this in advance. 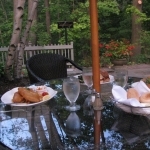 We returned to the peace of the Glenerin Inn and Spa where we were planning to enjoy their summer Thursday night BBQ on the patio. Due to the heat and threat of rain they moved indoors. We decided to brave the weather and sit on the patio anyway to enjoy the forested ridge and creek below. The door was open so we could still enjoy the lovely music of Cuerdos del Sol, a local guitar duo. They were wonderful! A second Jason was our server- and he was a joy, so attentive and accommodating. We ate our dinner and enjoyed our final evening in Canada listening to Spanish guitar music along with a chorus of tree frogs. Sigh…. Back to the mom world tomorrow. Courtney Godsey has previously produced and scripted the award-winning, internationally broadcast TV series Fun Food Adventures for TBN. The show was broadcast to 129 million households in the US and to 3 billion households worldwide. The series led the ratings for that network for several years and drew in a diverse age group of viewers due to the superb scripting that appealed to both children and adults. Courtney has worked behind the camera for over 15 years and has an extensive background in travel logistics and resource management. She now co-hosts the tv show Two Moms and a Car and shares travel tips and her journals in the sites blog. The Highs and Lows and Highs of travel.